The Elves line has provided plenty of inspiration for John and I with its unique colors and fantasy styling. We were provided with quite a few of the most recent Elves sets by the LCE team, and this is the first of several creations based around the theme. In this post we detail the design process of our Elves Forest Fortress and what it's like building a model heavily influenced by official sets. I began by messing with the chassis for the Goblin siege tower as they obviously have a fondness for weaponized vehicles. We knew we wanted the axes in front to slice in and out as the vehicle rolled, which took a bit of trial and error to get to work smoothly. At this point color didn't matter, so I used whatever was most convenient to experiment. A fairly simple crank shaft setup achieved the movement we wanted. After getting the rolling function to work smoothly, I went through and replaced any placeholder colors with black. While I was working on the siege tower, John got started on a dragon for the Elves. He was inspired by the baby dragons from the Elves theme and decided to try and build a full size dragon with a similar style of transparent and solid colors mixed together. Fortunately there's a good supply of transparent pink parts in the Elves sets, which look great against the light aqua. John chose to give the dragon very small front limbs - again taking inspiration from the baby dragon. Yellowish green is the signature color for the Goblins, so I started the tower portion on the siege engine with panels in that color. Sand green tooth plates are used for battlements on the Goblin fortress, leading me to incorporate a very similar technique on the siege tower's front. Due to the depth needed for the axe mechanism, the siege tower had a much thicker chassis than I expected. A few ladders on the back allow the small of stature Goblins to get into the large machine. Back at the front platform, some mounted cross bows give even more firepower to the vehicle. At first I only had two levels for the actual tower, but that looked a bit short. John agreed, so I then added a third floor and shifted the drawbridge up a level. More sand green tooth plates along with a few larger spikes finished off the battlements at the rear. I basically copied the crank mechanism for the drawbridge from the Goblin King's Fortress, but it still took quite a few versions before the chains wound up smoothly. This ended up being the final rendition - using black gears rather than the reddish brown cranks. By this point the exterior of the siege tower was mostly complete. So I took a look at our stickers and printed parts from the Elves line, to see which ones would be fitting here. One of the shelf stickers worked perfectly for a small bedroom located on the second floor. While this red 2x4 tile with sticker is used as a rug in one of the sets, I liked how it looked as a table cloth here. The 2x2 tile shows a diagram of the Goblins' prison cart. With the interiors finished, it was time to make something for the siege tower to attack! Often Elves buildings are set up on bases that use plates with rounded edges, which I imitated in this layout for an Elves castle in the forest. As a kid I hugely enjoyed the hinging walls featured in #6062. Which likely has played a large role in my building so many models with hinging walls. And I decided to do so again here. With four different portions connected by hinges, the castle can be closed up entirely. When deciding how the architecture of the fortress should look, I mainly referenced set #41196. I have been wanting to use these large prefab doors for a long time now, and really like how they fit in with the Elves aesthetic. And stacked arched windows were my first thought for the tower windows. But I wasn't satisfied with them, and tried a few other options next. Using a 6 long bar ended up working best. And the lanterns by the doors are just a modified version of what is used in the official sets. While I knew there would be lots of small trees and other details incorporated into the walls later, I started with mostly just tan bricks to quickly figure out the size and shape of each castle section. A rounded balcony topped off each gateway tower and gave a good excuse to use some new macaroni tiles. Next to the gatehouse I envisioned a large arch in the wall over a good sized stream. The large crystals featured so prominently in Elves sets are one of my favorite things about theme, so I made sure to include some around the river. Like the official sets, I used trans light blue and dark azue for the water. And had just enough space to include a lily pad which is another lovely design taken directly from the sets. Many of the larger Elves buildings have a slide, and the pool below the waterfall seemed like a great place to land. Heading back to the gateway area, it was time to figure out some roof lines. I was unsure what colors to use, and tried lavender and lime green first. The upper roof uses a very similar technique to what most Elves sets have, while the lower one is handled a bit differently since it had the benefit of a solid wall behind it. Lavender looked nice, but these two roofs used just about all of our curved slopes in that color. So I settled on lime green with green accents which also fit better with the forest setting. There's basically a mini-tower on each side of the stream, capped by more signature Elves style roofs. I wasn't happy with how the slide fit into the wall though. So I re-positioned it slightly which allowed for a much cleaner fit. Then it was time to go back through and add plenty of trees to the fortress. Most Elves buildings incorporate trees which is a rather unique design choice that helps establish their distinct look. Mixing the leaf colors and adding some jewels and flowers worked better than separate colors for various trees. Next I finished the landscape with details like mushrooms, more crystals, and lime green plants. 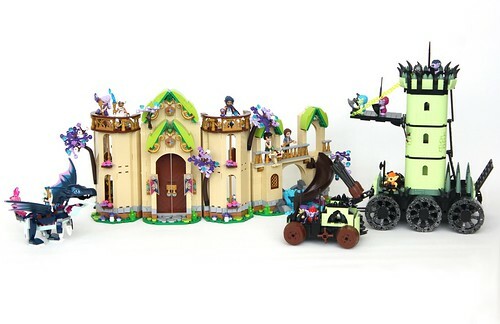 All of which are things often found in the official sets. You can also see a bley version of the tower balcony on one side here, and reddish brown on the other. In the end we found reddish brown to be a better fit. For the castle's interior I included a music room, kitchen, bedroom, and plenty of shelves. Once again stickers and printed parts proved useful to give additional detail. Here's what the finished model ended up looking like, and you can check out more high resolution images on flickr. Also check out the play features in action in this video on Youtube. We hope you enjoyed this look behind the scenes, and be sure to stay tuned for more Elves builds in the coming weeks!